Did you just do your dishes and found that they still have a cloudy film clinging to them? Did you take a shower in the morning but still feel like your hair is slimy and your skin is dried out? Does the tap water have a funny taste to it? These signs all indicate that something’s fishy with your home water system. When you use your plumbing—be it for doing dishes, washing clothes, showering, and even for drinking—you want clean, pure water that is healthy and safe for use. But hard water has become an increasingly common problem that poses a big threat to your water system. With a number of microbes and toxins potentially polluting your home water, you need a water purification system that can help you cleanse your home’s water system. Pro Serve Plumbing offers expert water purification solutions that can help you combat the menacing problem of hard water. 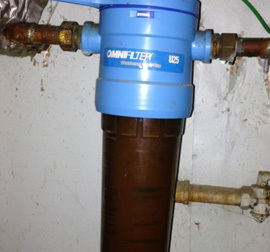 We have reliable resources for helping you with water treatment systems for your home. We will ensure that the water coming from your home’s faucets is high-quality! Ready to have your current water heater repaired or have a brand new one installed? Call us! Our expert plumbers have all the necessary training and experience to take care of any job, no matter how small or serious. Our emergency plumbing services are one of the best in the area.